Many thanks to everyone who came to the Annual General Meeting of Bosavern Community Enterprises, the not-for-profit body who now oversee the community farm and Kenidjack Allotments. 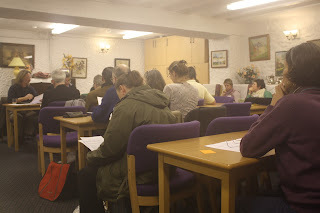 A turn-out of 28 people, most of them shareholders, was very good. More information, and the minutes, can be found on the BCEnts website. Selling eggs, turkeys and veg boxes. Raffle prizes for the night. 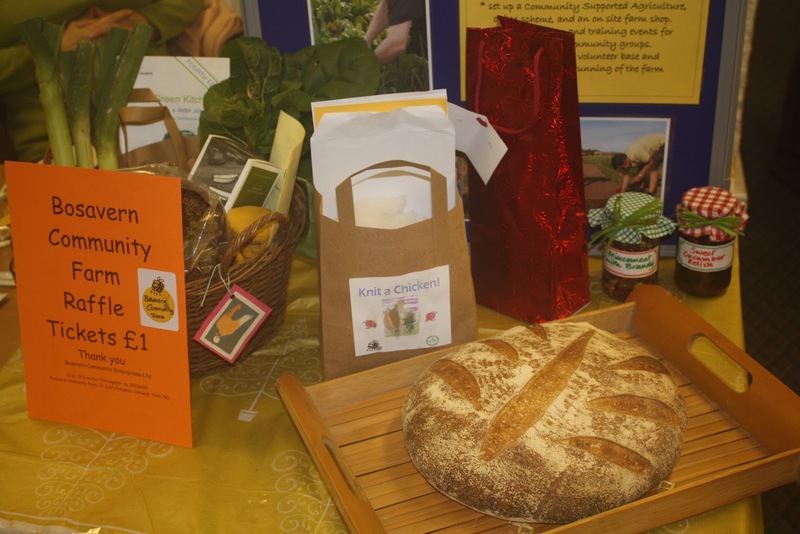 Thanks to everyone who bought eggs and raffle tickets on the night - special thanks to the Apple Tree Cafe, Andrew Corser, and Sonja Fairfield for donating raffle prizes. 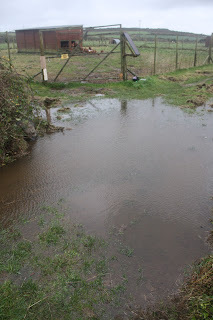 Whilst lucky compared to some low lying regions of the West Country, the recent deluges have brought a few problems to the farm, such as having to wade through shin-deep water to reach the chickens, and running repairs to the skin of our old polytunnel (due to be re-skinned before the spring). 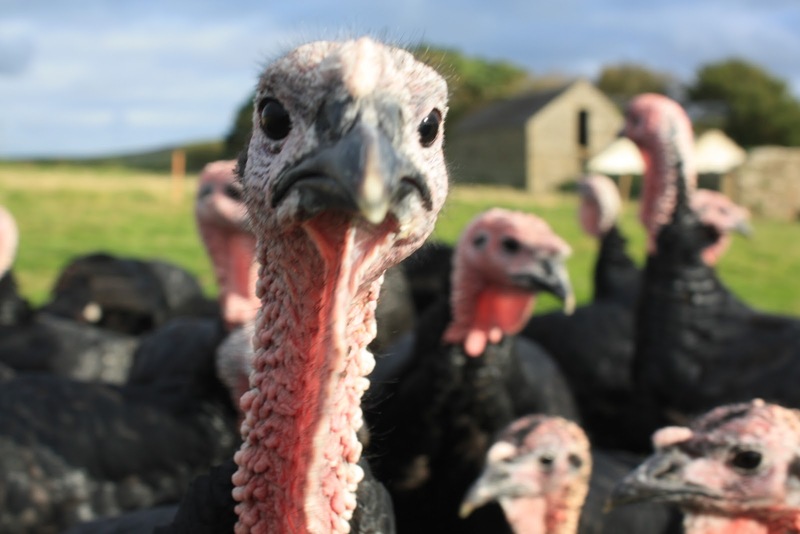 We haven't been able to lift and store more potatoes as we would have liked, or to let the turkeys out of their shed. 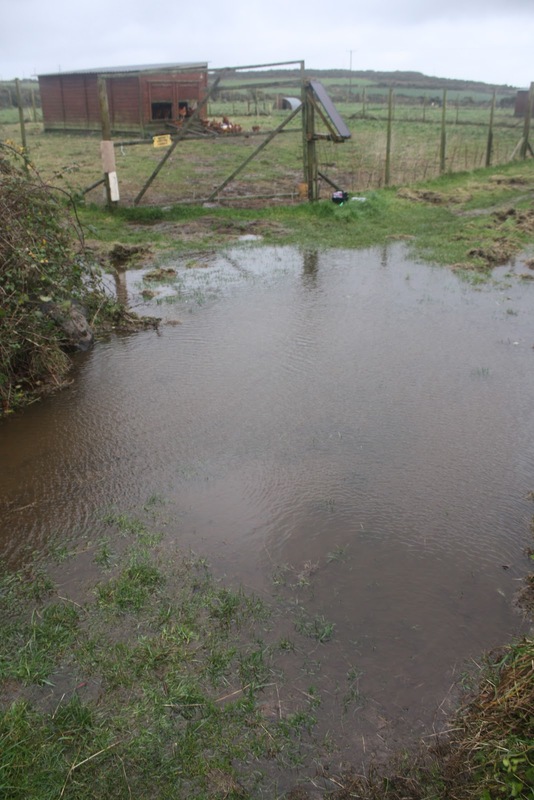 Small lake in the chicken field gateway. 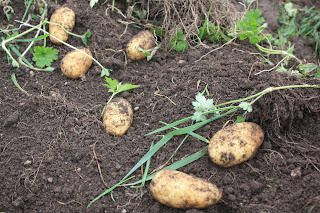 Before the recent deluges, we took advantage of a brief dry spell and the offer of help from a close neighbour, and lifted one third of our potatoes from the Maincrop Field. Because our gateways are small, only small old machines can fit onto the farm, so Howard brought his two-row-elevator along, squeezed past the chicken fencing, and lifted the Charlotte potatoes for us. 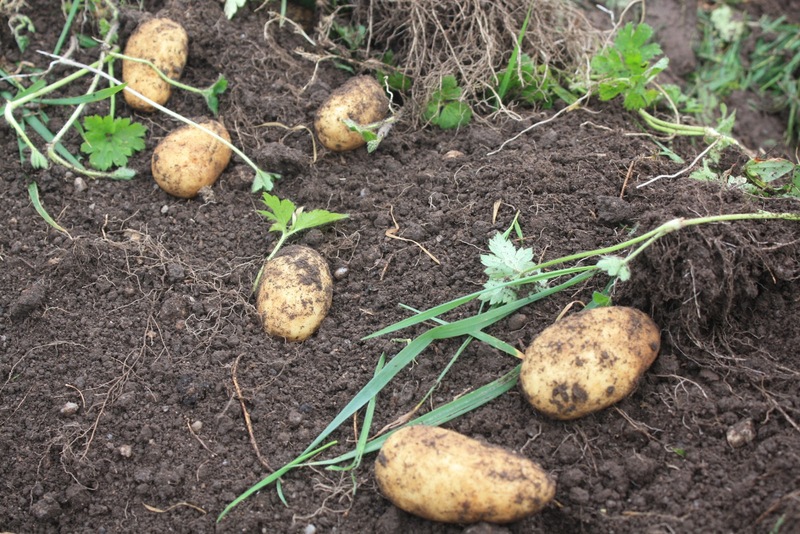 Thankfully these potatoes have a lot less eel-worm damage than those we had dug by hand from around the perimeter of the field, making sorting and packing a more pleasant task. 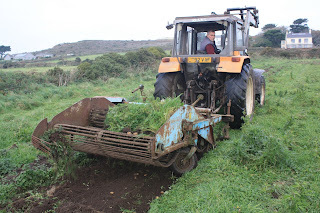 Unfortunately though, the amount of grass that had grown over the potato field still made the potatoes difficult to find even having been lifted, because the turf fell back on top to cover them up again - but it was still several times faster than digging by hand. Potatoes lifted and awaiting collection. 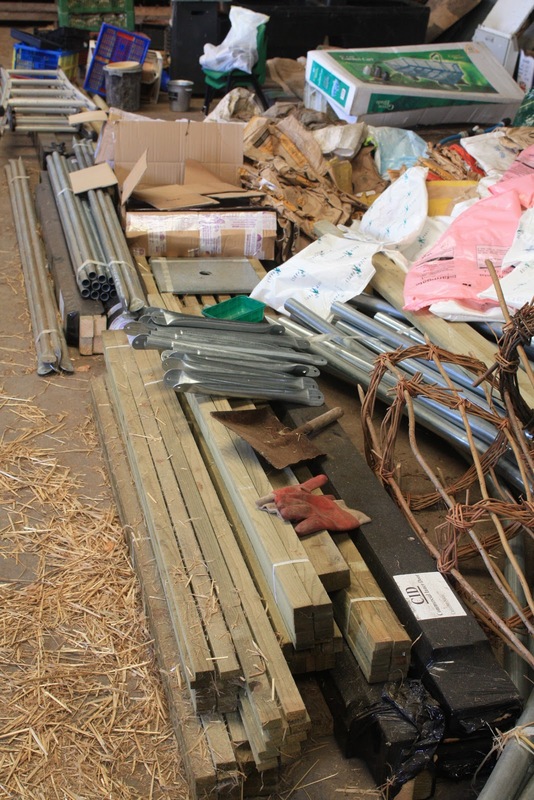 We have stored the potatoes in the cow shed, surrounded by a wall of hay bales and covered over by hessian sacks, to allow them to breathe whilst keeping out the daylight so they don't turn green. 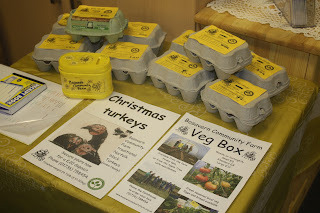 Potatoes are always available in the stall at the farm gate, for £1 per kilo, and of course are a basic component in our weekly veg-boxes. 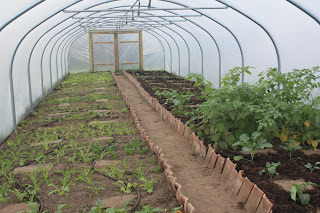 The new polytunnel over time. 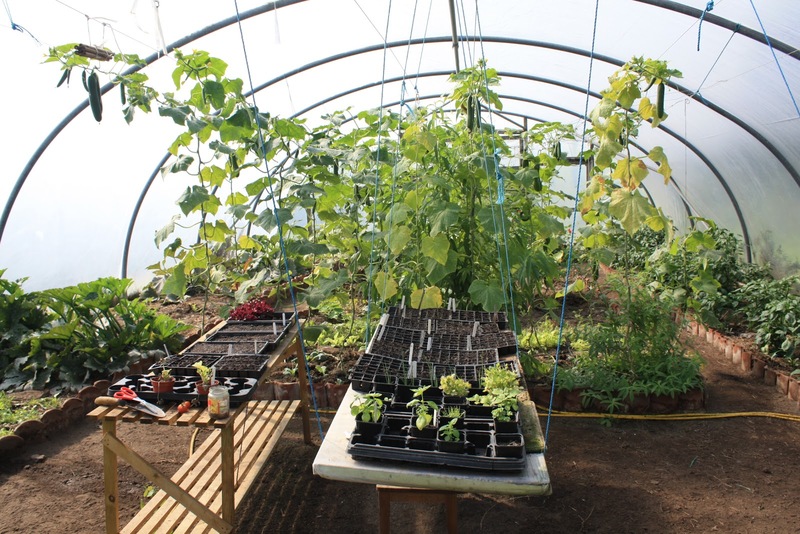 Looking at the last entry, showing photos of our old polytunnel "The Mothership" over the past two years, we thought it was a good idea to show how the new polytunnel "The Sausage" has come on since construction last year. 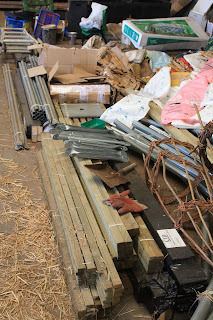 October 2011, new polytunnel in pieces stored in the cow shed. 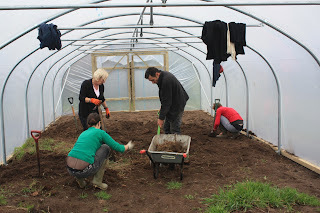 November 2011, digging couch roots out inside the newly constructed tunnel. 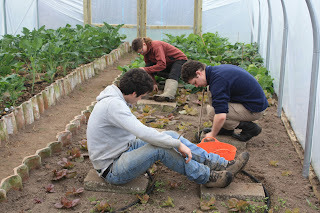 March 2012, weeding the winter crops - green sprouting calabrese, spring cabbage, winter lettuce, and kohl rabi. August 2012, full of tomatoes. 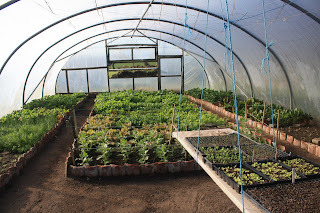 November 2012, winter salads, green sprouting calabrese, and physallis. 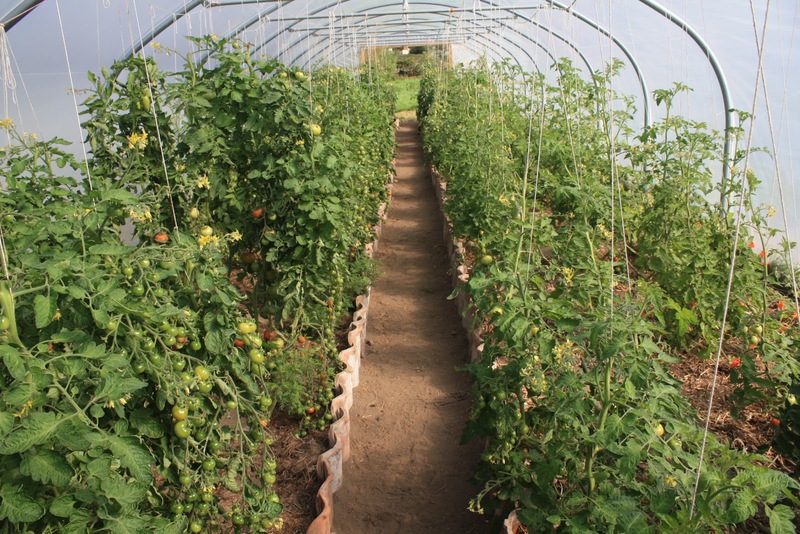 On Monday last week I was invited to give a presentation on "The Growing of Bosavern Community Farm" to the Ludgvan Horticultural Society. 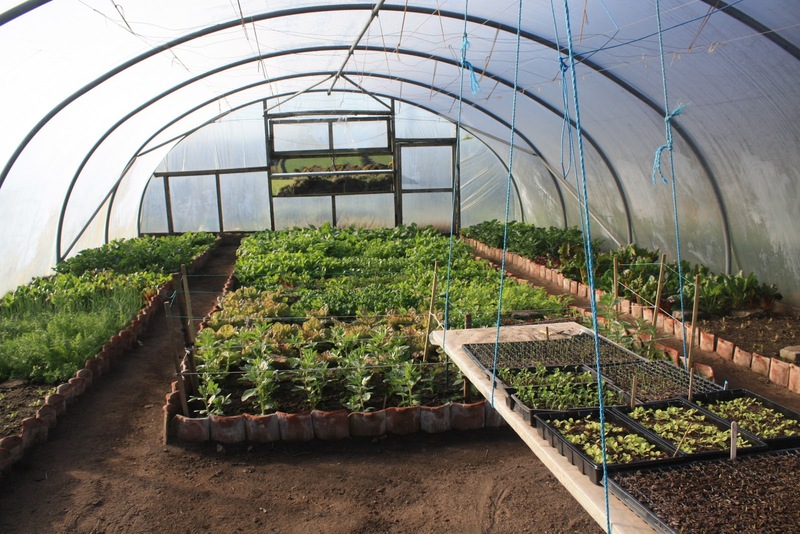 I showed photos of how the farm had developed over the past three years, and I'd like to thank the society and its members for their attentiveness and enthusiasm, as well as the donation they made to the farm. The presentation also underlined once again how far we've come in a relatively short space of time, as the following photos shown on the night will prove. The older hens from our laying flock are now three years old, and the best of their laying days are behind them. They don't eat much feed, they love pecking and scratching around in the soil, they like eating grass and weeds and snails, they lay the occasional large egg (once a week at best), and they are inquisitive little characters. They are now looking for new homes, as we need to make way for new laying hens in a few months time. If you would like to offer a home to two or more of these old girls (they need company), we have been selling them at £1 each, although we could easily be persuaded to give them away for free (or a small donation?). Please phone us on 788454, or call in. 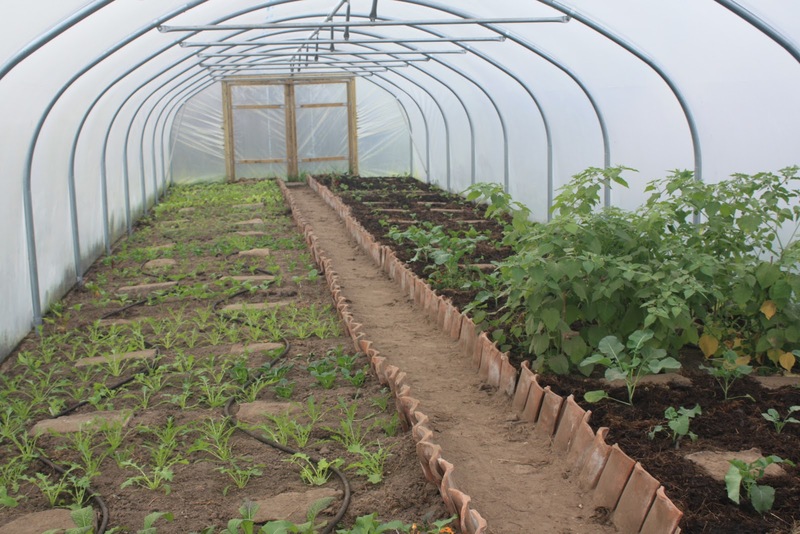 Bosavern Community Enterprises, the body which oversees Bosavern Community Farm, is holding its Annual General Meeting on Friday 23rd November at 7pm, at Age Concern on St Just's Fore Street. The meeting is open to anybody wishing to attend, though only members/share-holders of BCEnts can vote on motions. There will be a raffle to raise money for the farm, and refreshments too I'm sure. Following our grant from the Big Lottery, there will be a handful of new posts at the farm. Please keep a lookout on the BCEnts webpage www.bcents.org for the most recent information and job specifications. Many thanks go to Ivana, who left us on Sunday having volunteered on the farm for two weeks. 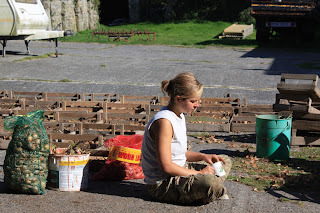 Ivana is heading to Embercombe near Exeter - www.embercombe.co.uk - and we wish her all the best for her onward WWOOF adventures. Thanks again to Ellie, who volunteered with us for the month of September, then returned for another week at the end of October. Special thanks go to Ellie for running the two "Art On The Farm" workshops whilst here. 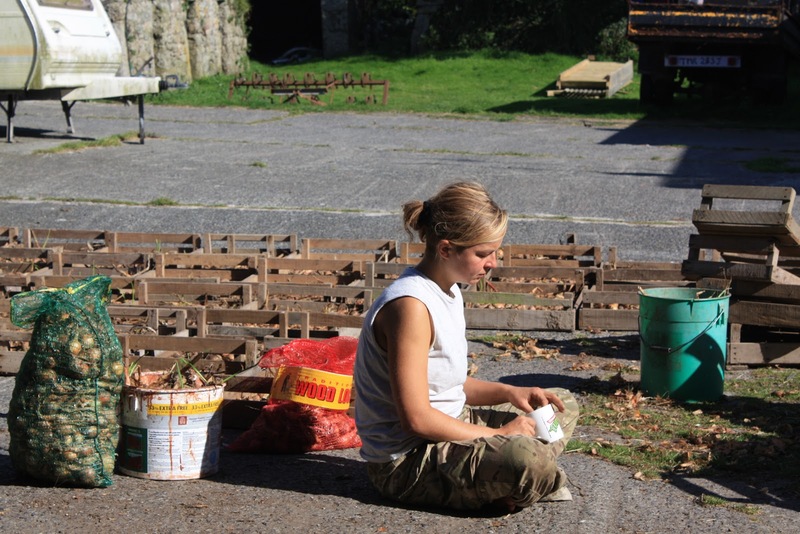 Ellie takes a break whilst sacking onions in the farmyard. 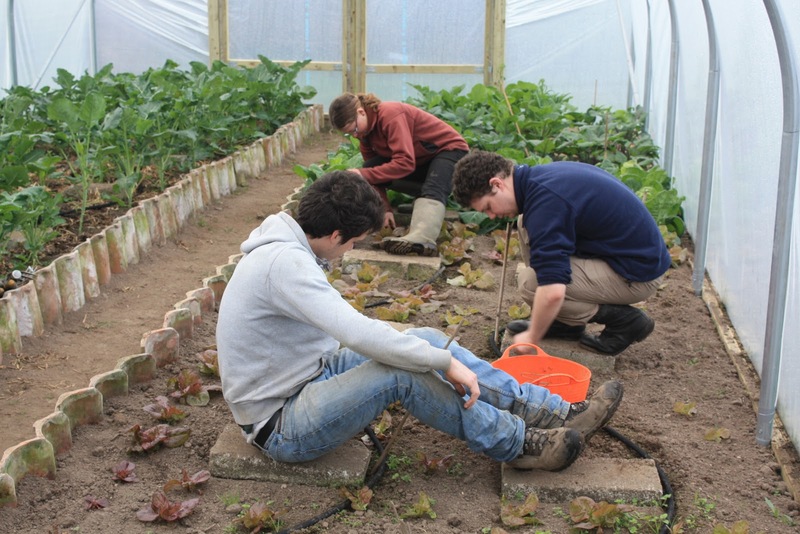 Thanks to Rafael, who volunteered on the farm over the weekend - good luck with your onward hitch-hiking!